Jesus gasped for air as clouds darkened not only the sky but the hearts and minds of His followers. Blood dripped from His body landing on the ground with a splat. The cross was a bloody mess and it was all to pay the price for my sin and yours. My friend, my precious friend, the certificate of debt against you, yes, you, is canceled out. There is nothing hostile to you. It has been taken out of the way. His blood paid the price for your sin. There is no need to wallow in guilt and shame, locked in a never ending cycle of remorse, regret and recitation of your sins if you have put your faith in Christ. Do you struggle with shame and guilt as I did for too many years? That only makes a mockery of His death. Have you shopped at Sam’s Club or Costco? If so then you know once you pay for your products you are stopped at the exit where your receipt is taken and checked against the items in your cart. What would you do if they kept your receipt and told you to go back through and repay for your groceries? No one in their right mind would re-pay for something they had already paid for. Girl, it is time you and I get in our right mind when it comes to sin! Because of grace, you and I have no debt of sin to pay, no work to do to please Him. We have nothing to prove to Him. He proved it all for us on the cross. 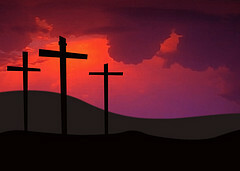 Today remember His death on the cross was for you. Realize that the mess of His blood covered the mess of your sin. Because of His cross, His blood and His death and most assuredly His resurrection, you are redeemed and forgiven, simply by believing He died for you and rose again from the dead!